Click on the image to enlarge and/or save. Hello everyone. First of all, thank you for the amazing support that has already been shown for Ryan and Andrea. Its hard to believe that in 10 days we will be on our way to Houston for Ryan to undergo open brain surgery. The thought takes my breath away. My hope and mission is to raise as much money as possible to help with the medical and daily living expenses not only now, but in the future. This is such a heavy burden for Ryan and Andrea, and it is really the only way and thing I know to do at this point. We have created this flyer, and I am willing to print them out and mail to whomever would like to pass them out. If your company sends out monthly statements, I will send enough for you to include in them. Is there a grocery store in your area that would allow you to place a flyer in each customer’s grocery bag? Does your church allow non-member fundraiser information to be sent out in bulletins? Community bulletin boards at stores, restaurants, churches, etc? If you are interested, please send me an email at m.chinn@cureasc.org and I will be happy to get them sent out to you as soon as possible. 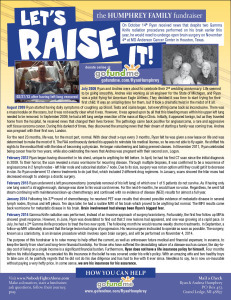 In addition, here is a more simple flyer that strictly promotes the GoFundMe fundraiser. You may view and print the flyer here. Last but not least, please click on the GoFundMe link and share it with your Facebook friends. We need to get the word out!